Washington is mulling the delivery of stealthy F-22 Raptor fighter jets to Europe in the face of a "resurgent Russia", according to US Air Force Secretary Deborah Lee James. The US Air Force plans to further increase the number of its rotational forces in Europe amid tensions with Russia and could deploy the F-22 fighter to Europe, US Air Force Secretary Deborah Lee James was quoted by the Wall Street Journal as saying. She made the statement during the Paris Airshow at Le Bourget earlier this week. "That’s the beginning, there will be more. You'll continue to see more and more rotational forces. The biggest threat on my mind is what’s happening with Russia and the activities of Russia. That’s a big part of why I’m here in Europe," James said. She added that she saw "no reason" why the fifth-generation F-22 fighter jets could not be stationed in Europe, but refused to elaborate. 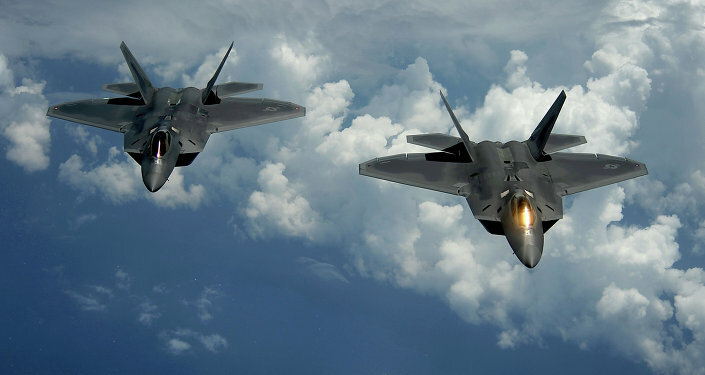 The statement came shortly after the US military awarded defense contractor Lockheed Martin nearly 70 million dollars to add flying hours to the F-22 Raptor fighter jets. Earlier, the US Air Force stepped up its number of air patrols in the Baltics as Britain received B-2 stealth bombers and B-52 bombers from the US. On Monday, it was reported that the Pentagon is poised to send heavy military equipment to Eastern Europe and the Baltic nations, as part of its effort to strengthen US forces there. The move was harshly condemned by Russia, which said that this possible decision would undermine the 1997 Russia-NATO Founding Act.